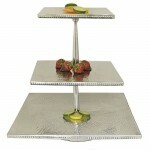 HAMMERED 3 TIER SQUARE FRUIT OR CUP CAKE STAND Size : 20"L X 20"W X 22"H .. 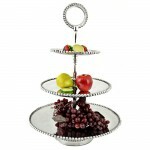 ROUND 2 TIER HAMMERED CUP CAKE OR FRUIT STAND W/ ROUNDED HANDLE Size : 19"L X 19"W X 13.5"H ..
RECT. 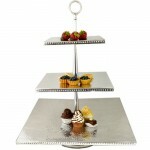 4 TIER HAMMERED FRUIT OR CUP CAKE STAND ..
MULTI FDL 3 TIER SQ FRUIT STAND ..
THREE ALUMINIUM TRAY W/IRON STAND 12 x 17 x 8.50 EACH TRAY 10x 4" ..
THREE ALUMINIUM FDL TRAY W/IRON STAND 12 x 17 x 8.50 EACH TRAY 10x 4" .. 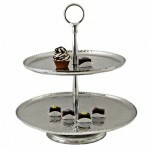 ROUND 2 TIER HAMMERED CUP CAKE OR FRUIT STAND W/ROUNDED HANDLE ..
RECT. 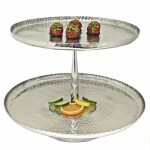 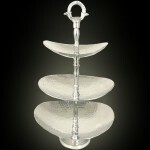 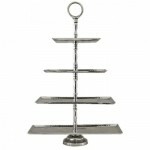 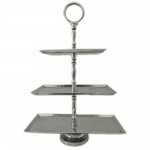 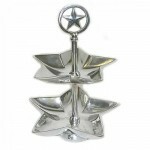 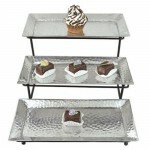 3 TIER HAMMERED FRUIT OR CUP CAKE STAND .. 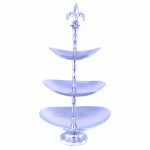 HAMMERED 3 TIER SQUARE FRUIT OR CUP CAKE STAND SMALL PLATE 11" MIDDLE PLATE 14"..
3 TIER BEADED FRUIT STAND Size: 16" X 16" X 25" .. 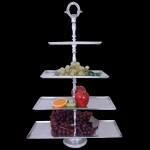 HAMMERED 4 TIER FRUIT STAND W/HANDLE .. 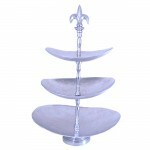 HAMMERED 3 TIER FRUIT STAND W/RING TOP ..
3 TIER FRUIT STAND OVAL W/ FDL AND HAMMERED DESIGN .. 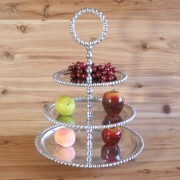 HAMMERED OVAL 3 TIER FRUIT STAND ..
FDL FRUIT STAND / BEADED OVAL ..
BEADED FRUIT STAND / SQUARE 2 TIER ..
STAR FRUIT STAND SIZE : ONE ..